On December 16th an article appeared on the BBC News website’s US & Canada and Middle East pages under the headline “Trump’s new US envoy to Israel seeks Jerusalem base”. The article was subsequently amended several times and is currently titled “Trump chooses pro-settlement hardliner as Israel envoy“. “US President-elect Donald Trump has chosen right-winger David Friedman as America’s next ambassador to Israel. “…the US embassy has been located in Tel Aviv for decades. However, the report refrains from informing BBC audiences that previous US presidential candidates – both Republican and Democrat – pledged to do the same during their election campaigns. Neither are readers informed of the existence of the 1995 Jerusalem Embassy Relocation Act and the related bi-annual presidential wavers. Whether or not the US embassy in Israel will be moved to Jerusalem under the Trump administration remains to be seen, but obviously the president elect’s statement on the topic is in no way as novel as this report implies. BBC audiences have clearly not been provided with the full range of information which would enable the proper understanding of this story. J Street: a 501(c)(4) non-profit corporation and registered lobby. JStreetPAC: a political action committee endorsing federal candidates. We must therefore conclude that written permission from the head of the relevant BBC department was obtained in advance of the advertisement of the BBC Washington correspondent Kim Ghattas’ upcoming appearance as a speaker at J Street’s 5th conference and that the use of her BBC title in that advertising has been “expressly approved” by the BBC. 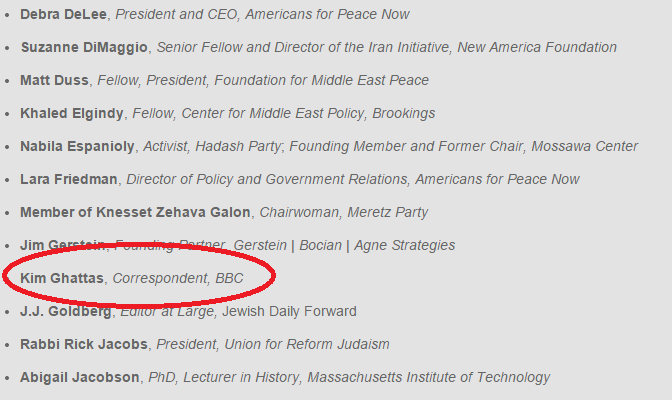 The approval of Ghattas’ appearance as a speaker at J Street’s conference clearly indicates that the BBC is under the impression that it does not undermine the corporation’s impartiality. That impression is of course grossly mistaken.